The recent news that CNN and NBC have canceled projects about the life of Hillary Clinton after pressure from both sides of the political spectrum is one more indication that the maneuvering in advance of the 2016 presidential election is already underway—more than three years before voters go to the polls. Presidential campaign coverage always seems to start early, and perhaps more so this year. The 2016 election has received more media coverage this year than either the 2012 or 2008 campaigns received during comparable time frames, according to a Pew Research Center analysis of major U.S. newspapers. And thus far in 2013, the potential candidate generating the most coverage is former Secretary of State, senator and First Lady Hillary Clinton. A search of the LexisNexis database of 15 of the nation’s largest newspapers from Jan. 1-Sept. 27, 2013, identified 335 stories that talked about the 2016 campaign. That is more than double the coverage the 2012 campaign received (132 stories) during the first nine months in 2009. One reason for lighter coverage four years ago was that the 2012 election featured an incumbent president with no significant challengers within his party, so attention was focused almost solely on the Republican side. In the 2008 presidential race, both parties had contested nomination battles. 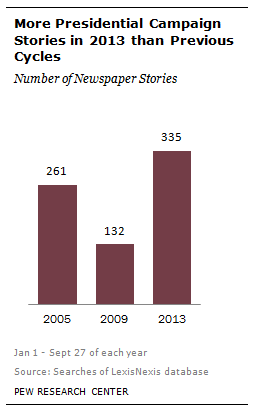 Yet, there have been 28% more campaign stories in 2013 than there were in 2005 (261 stories). The amount of early campaign coverage this year may be even more noteworthy because the LexisNexis search found far fewer stories overall—20% fewer—in newspaper archives now than in 2005. Hillary Clinton tops that list of potential 2016 candidates who have been included in coverage, with 66 campaign stories referring to her as a possible candidate. In the great mentioning game, Clinton was followed by three Republicans—Florida Senator Marco Rubio (52 stories), Kentucky Senator Rand Paul (48) and New Jersey Governor Chris Christie (45). The only Democrat other than Clinton to receive significant coverage was Vice President Joe Biden, with 35 stories. Overall, there have been more stories mentioning at least one of the prominent GOP candidates (110) than Democrats (81). This is likely due to the fact that there have been more individuals mentioned as potential Republican nominees—including Sarah Palin (12 stories) and Donald Trump (11 stories)—than on the Democratic side, where no one other than Clinton or Biden has received more than modest attention. See the methodology for this analysis here.